“We cannot reconcile with geopolitics, but we can reconcile with our brothers,” Major Archbishop Sviatoslav Shevchuk of Kyiv-Halych told CNA Feb. 23. Archbishop Shevchuk said the declaration has many positive points, while also emphasizing some critical points of the declaration. He considered it too imbalanced toward the Russian Orthodox positions, and in general excessively politically oriented. The archbishop had also voiced his criticism in a Feb. 14 interview on the Ukrainian Greek-Catholic Church’s web site. “I agree to call that meeting historical, as we need to meet in order to discuss and to carry forward our path to unity,” the archbishop said. “We must not fix our attention on one only point. We must think what to do after. The first thing is to free religion from politics. We cannot reconcile with geopolitics, but we can reconcile with our brothers,” he said. Archbishop Shevchuk is Major Archbishop of the Ukrainian Greek-Catholic Church and a member of the Pontifical Council for the Promotion of Christian Unity. The dicastery was directly involved in drafting the joint declaration. However, Archbishop Shevchuk was not involved in the drafting process, nor was he asked for recommendations. “There are two points of view: that of the universal Church, and that of the local Church, that might see the same problems, but from a different point of view. For this reason, to us, to the Ukrainian Greek-Catholic Church, it was important to listen to the Holy Father and at the same time to be listened to by the Holy Father,” the archbishop said. Archbishop Shevchuk became close to Pope Francis when both were in Argentina. He served as a bishop in the Ukrainian Eparchy of Santa Maria del Patrocinio in Buenos Aires from 2009-2011, while Bergoglio served as the Archbishop of Buenos Aires. The Pope recalled their friendship during his inflight press conference Feb. 18. Archbishop Shevchuk said he was “moved by the paternal, sincere Holy Father’s words” toward him. He said that Pope’s trust and frankness with his friends is one of his strong characteristics. This is the reason why he feels “free to be frank, sincere and transparent” when speaking with the Pope. “I want to be the spokesperson of the sentiments, pains and even doubts of the Ukrainian people. I want to be the mediator between simple-minded believers and the Holy Father,” the archbishop said. Archbishop Shevchuk will meet with the Pope March 5, at the end of the Synod of the Ukrainian Greek-Catholic Church. He described the Ukrainian Greek-Catholic Church as composed of two realms. On one side, it shares “the same liturgy, theology and also some history with Orthodox Churches, especially with the Patriarchate of Moscow.” On the other, it is in full communion with the successor of Peter. According to Archbishop Shevchuk, “it is natural that nowadays being Catholic means being ecumenical,” and the Ukrainian Greek-Catholic Church thus has a mission to promote Christian unity. St. John Paul II used to say that Europe had to breathe with two lungs, a saying cited by the archbishop. “The fact that there are so many Eastern Churches in the Catholic Church is a richness. And we, as an Eastern Church, are called to share this richness, as our particularity makes us prepared, and encouraged, to undertake a sincere, true and authentic dialogue with the Orthodox Churches,” Archbishop Shevchuk said. The Ukrainian Greek-Catholic Church has lived through difficult situations. Although it is fully recognized as a self-governing Eastern Catholic Church, the Orthodox did not acknowledge its right to exist. “Orthodoxy must acknowledge our right to exist,” Archbishop Shevchuk said. 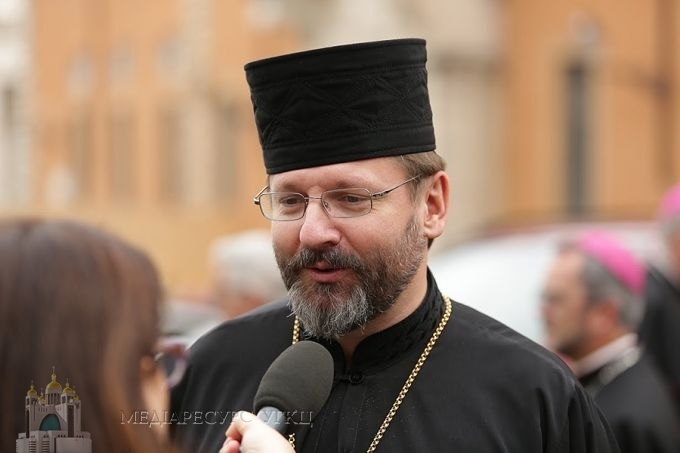 “The ecumenical vocabulary of the Catholic Church uses the phrase ‘ecclesial communities’ to refer to Protestant Churches, that is to label those communities which do not bear all the richness of the apostolic tradition,” explained Archbishop Shevchuk. “In the end, we are not called to ask anyone permission for our right to exist,” the Major Archbishop emphasized.